Thank you to the Cleveland Clinic Healthy Heart Cookbook for this delicious recipe. 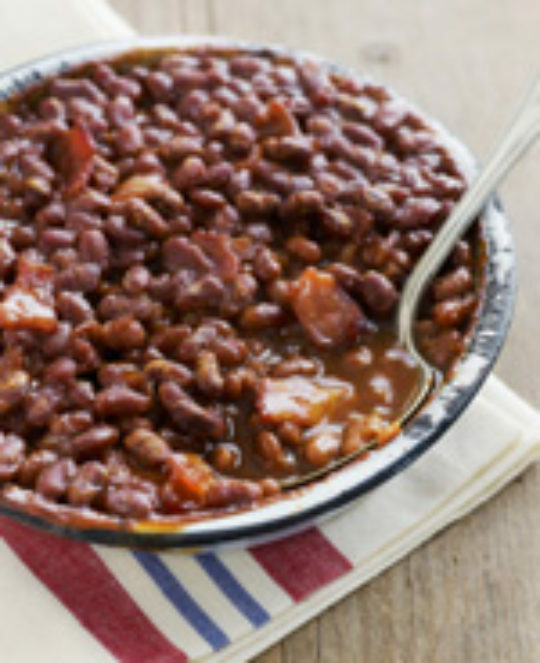 Warm yourself on a cool fall day with these baked beans. Mix peas, beans and onions to bring out the flavor. These baked beans can be made with or without the kielbasa. Either way, they are a tasty and nutritious side dish for picnics or at dinner. Spray large oven-safe casserole with vegetable oil spray. If you are using canned beans, drain and rinse well. Place measured amount of beans in the sprayed casserole dish. Slice kielbasa thinly and then cut slices into quarters; add to beans. Add chopped onion, tomato sauce, ground mustard, chili powder, brown sugar twin, brown sugar and lemon juice. Mix well. Place in oven uncovered and bake for 45 minutes, stirring once or twice during the baking process.